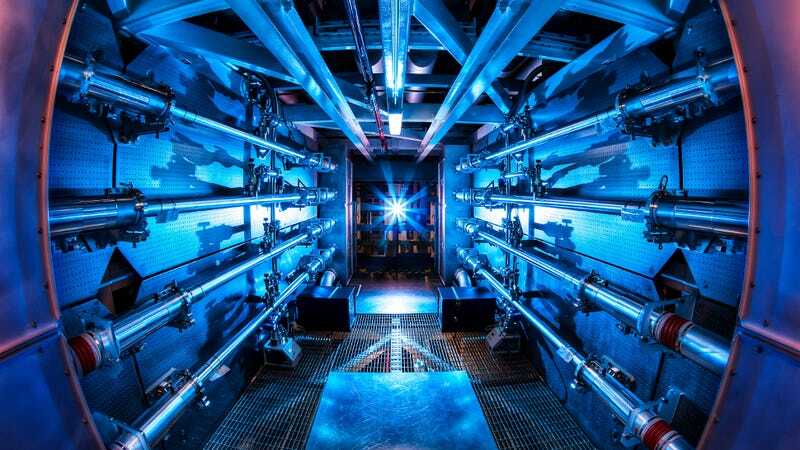 Now, as the BBC is reporting, scientists at the National Ignition Facility (NIF) in the United States used 192 beams from the world's most powerful laser — a huge laser rig the size of three football fields — to heat and compress a tiny capsule of hydrogen fuel to the point where nuclear fusion reactions take place. That's about 3.3 million Kelvin, or 5.9 million degrees Fahrenheit. The resulting implosion of the fuel in the capsule releases usable energy. But during an experiment last month, the amount of energy released through a fusion reaction exceeded the amount of energy being absorbed by the fuel. It's the first time this has been achieved at any fusion facility in the world. This is a step short of the lab's stated goal of "ignition", where nuclear fusion generates as much energy as the lasers supply. This is because known "inefficiencies" in different parts of the system mean not all the energy supplied through the laser is delivered to the fuel. Image: Preamplifier at the National Ignition Facility via Lawrence Livermore National Laboratory.